Ann Warburton (1713-1798) doesn’t get mentioned in most writings about 18th and 19th century Staffordshire pottery. But she had an impressive resume just the same. It all began when the wealthy Biddulph family, on whose property Joseph Warburton (1694-1752) rented, needed cash in hand more than long term rents. 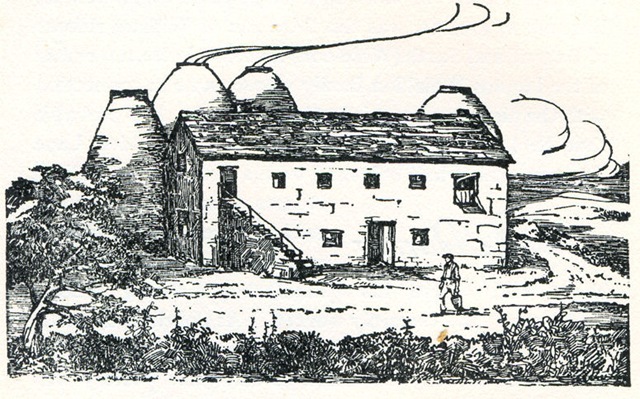 Joseph bought a plot on Hot Lane and jumped into the salt-fired white stoneware business. His son John (1720-1761) took over in 1759. When Ann married John, she brought her considerable knowledge of enameling on both white stoneware and creamware to the business. She had learned these skills from her father, Ralph Daniel, another prominent local potter. Ann and John Warburton eventually teamed up with neighbor Richard Adams, an in-law of the famous potter Thomas Whieldon (Josiah Wedgwood was Whieldon’s junior partner at the time, and Josiah Spode his apprentice). Enameled white stoneware from the Warburton’s Hot Lane pottery sold very well, especially in Holland. After John’s death in 1761, Ann ran the pottery as Ann Warburton & Son. Josiah Wedgwood was impressed enough with Ann’s work to send her some of his own creamware for enameling. She went on to out-compete Wedgwood in the southern states of the lucrative American market. Her son Thomas died in the same year as Ann, in 1798. Ann’s talent was such that she could handily compete with Dutch enameled ware on its own turf, decorate for Wedgwood, and out sell him in parts of his largest market. Ann Warburton deserves more credit today for her accomplishments. The name of her pottery’s location is pretty cool too – Hot Lane. The Warburton Pottery on Hot Lane. You are currently browsing the archives for the Ann Warburton category.